Like many grass roots protest campaigns, ours started almost accidentally. A broad cross section of the people in our town became involved, from both sides of politics, young, old, retired, employed, students, unemployed. We were not the popular media's stereo-typical rent-a-protest-crowd types often portrayed in the press. Maleny is fortunate in having a large number of retired professionals, many willing to put their money where their mouth is, and this helped in our campaign efforts. We did the sums at one stage, costing all the volunteer professionals working on our campaign, and we reckoned it would have cost at least $20,000 a week to run our campaign if they had been paid. We all learnt a lot during the protest campaign, what we should have done, what worked, what didn't work, how to engage with the media successfully, and the home truths about local, state and federal politics, big business, the status quo, and most disappointingly, about Australian public apathy. We hope that this information will be of use in other campaigns around Australia, be it for preservation of natural ecosystems, prevention of inappropriate or unwanted development, polution prevention etc etc... Also, please see our online resources page for much that will help in your campaign. Once a developer has purchased land and submitted plans for a development proposal it is often too late to do anything about it. If you local community wants to retain your local character, be pro-active in having the planning scheme amended to prevent what you don't want. Someone in your community needs to spend the time researching and getting to know the local planning scheme elements that are relevant to your area. Maximum sizes of commercial buildings, setbacks from waterways, height restrictions, covenants of vernacular architecture, advertising sign limitations, where future parks need to be located etc etc. The developers will have more money to throw at planning and environment court cases than local Councils will. The developers will try to exploit any loophole or weakness in legislation. The developers do not live in your town or locality, they will not have to live with the consequences of their actions. In a majority of cases, they are only concerned with bottom line profits. The developers know that the law will be on their side. A simple fact, plain and true. Local and State Government politicians and authorities like to deal with representative bodies or groups. Be it a local rate-payers association, local progress association, or environmental group. Hold regular meetings, become incorporated (for legal, liability, organisational and representational reasons), get to know your local Councillor and state MP. Invite them to your meetings. Seek to be represented on Council committees, working groups, task forces and the like. Make formal submissions when studies, reviews etc are advertised by state and local authorities. Lobby to have amendments made to local laws, your local planning scheme, and over-arching state level planning legislation when appropriate. Consider public education to raise the general community's level of knowledge and understanding of issues which are important to you. Occasionally a large for sale sign pops up on a commercial property or vacant lot, often it does not. Most local real estate agents have websites with commercial property or development opportunity properties listed. Some city based companies specialise in this kind of property. A bit of careful research will find out where you need to look to keep a finger on the pulse in your area. Being forewarned is being fore armed. Once an issue has reached the stage where public awareness and mass public support is needed for your cause, differing tactics are required. Local and state level government is often slow to respond to an issue of concern unless they receive a significant expression of concern by a local community. Issues of concern in differing communities vary widely, and every issue will have unique elements. 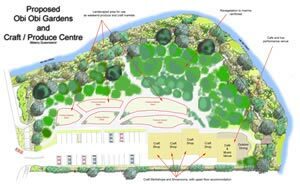 Here in Maleny our issue was with a planned development to construct a large supermarket in the wrong location. Other more suitable sites were available elsewhere in our town. It is important to point out that a small Brisbane development company chose to buy the land in Maleny because it was cheap (not in a good location and bound by land constraints), and that they then approached Woolworths to secure a long tenancy agreement to make the project viable. In our case, once Woolworths became involved, we were opposing one of the largest corporate names in Australia with millions of dollars of advertising budget and senior management with friends in high places in federal and state government. There were windows of opportunity for the parties involved in the development to back down, however a point of no return was reached once the 'David and Goliath' story captured the public imagination, and from this point senior Woolworths executives saw the danger in a precedent being set which would complicate their national expansion plans. Maleny was doomed to have a supermarket, like it or not. Australians on the most part have it good. Nice weather, good quality of life, no draconian government. Some might argue we have had it too good for too long and that this has made the average Australian apathetic. 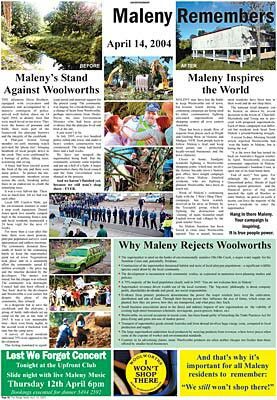 Our experience in the campaign against the Woolworths development in Maleny has been enlightening. 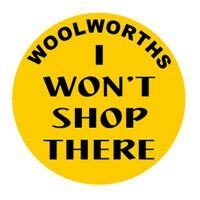 Around 20% of our population actively opposed the Woolworths development and attended rallies, protested at the site, and assisted in the campaign at various times. Over 70% of those surveyed in our community thought that the location for the supermarket was inappropriate and that alternative better sites were available. Well over half of the local population were, however, more concerned with their own personal convenience when it came to the crunch time of direct protest action. 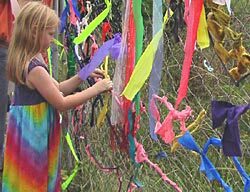 Continued closure of the Maleny-Landsborough Road in mid July 2005, and disruption of the main street retail trade during protest marches in July and August 2005 were not popular with many in our town. Consider carefully the pros and cons of direct protest action, and the impact that disruption on the average person's day-to-day activities that your protest action will be causing. In some cases the actual disruption to people is the point of the protest action (such as truck driver protests in order to gain media coverage of their plight). Politicians do not like being embroiled in controversial issues. We found that from Premier Peter Beattie down to local government we had one similar attitude to our cause - sympathy for our community concern, annoyance that it was happening during their term in office, desire to see the issue go away as soon as possible, willingness to use the full force of the law to make the issue go away, and invariably siding with the establishment big business against the local community. The one exception in our case was our local government Councillor, however he was up against a disinterested pro-development right wing Mayor and block of Councillors who sided with the Mayor. You may fare better with politicians in your campaign, we certainly hope so. We actually reached the higher management of Woolworths Ltd. The Chief Executive Officer, National Property Manager and Board of Directors were all very much aware of Maleny, the protest campaign, public opinion and the tarnishing of the corporate brand name which ensued. We would like to think that they learnt a lesson from Maleny and that in future they will take into greater consideration the concerns of local communities when they plan their corporate expansion. We caused the Queensland Government to tighten legislation pertaining to waterways and what can occur in close proximity to them. We were one of several high profile issues which were a catalyst to the Queensland Government radically overhauling local government in Queensland. Caloundra City Council was amalgamated into a greater Sunshine Coast Regional Council as a result. We have maintained in our local community the awareness that big is not necessarily best and that a range of diverse small retailers make for a vibrant and competitive marketplace. As a result Maleny still has three independent bakers, two independent butchers, and a range of other small speciality shops. In other communities of our size it is highly unlikely such diversity of small businesses would have survived the arrival of a Woolworths supermarket. We provided and continue to provide resources, advice, support and inspiration for other small communities around Australia facing a similar local planning issue - usually from a national corporate chain store such as Woolworths. Here are some specific points of advice for your action campaign. We had a few key people who were the 'spokespersons' for our campaign. They got to know the local television news crews and had their direct phone contact details. TV crews were often 'tipped off' on newsworthy events. Sometimes the developer and police found out, sometimes they didn't, but the value of good TV vision for a news story cannot be overstated. Wednesday seems to be the slow-news day and we arranged for a lot of the newsworthy events to take place on Wednesdays. Short sharp 15 to 20 second sound bytes are best for TV, choose your words carefully in advance and practice them. We managed to raise sufficient attention at a national level to have live TV interviews with the Channel 9 Today Show on several occasions; we featured on several in depth current affairs TV shows and featured in over 200 local, state wide and national TV news stories. Not every local campaign will attract such attention. Many of our TV events were imaginative, different and carefully arranged to make the evening news broadcasts. Wear colourful outfits, produce placards and banners which convey your message, create media events such as outdoor concerts, even street rallies, but be aware of the laws pertaining to outdoor protest events in your state and local region. Avoid stereo-typical protest actions if you can and avoid escalating into confrontational sensational TV vision if at all possible. It will do your campaign far more harm than good, may result in injuries or arrests, and will reduce the number of people willing to be involved in your campaign. When dealing with the media it is important to sort out one message only for each event. This is helped by key spokespeople meeting before the event, so that everyone is clear. Otherwise there's a risk the media will run with some offhand comment that is a side issue (as happened to us several times). Imaginative public awareness events and protests will draw media attention, however you may not get the precise message across that you seek disseminated. Advertising is the way to get your message out there in your terms. We placed many full, half and quarter page adverts into our local newspaper (The Range News) over the course of our campaign. We also placed adverts into regional papers such as The Sunshine Coast Daily. A series of adverts often attracts a discount; you may find your local paper proprietor is sympathetic to your cause and they may offer a further discount. Our highest profile and most highly visible advert was placed full-page nationally in the Weekend Australian after the invasion of our town by over 200 Queensland Police in 2005. This was a very expensive advert (many tens of thousands of dollars) which was funded by public donations from our community. We also continue to place public awareness adverts about the issues involved in our campaign in our local paper (pictured right). Informative full colour, full page adverts create the most impact. We found that advertising within the body of the paper was far more effective than flyer inserts, or for that matter flyers dropped into letter boxes. Direct advertising by flyers works when they are hand delivered in direct contact interaction. We have a highly visible and successful sticker campaign. Our yellow round stickers are found on car bumpers and back windows around Maleny and our region. We continue to have the stickers printed and distributed for gold coin donation (towards printing cost). We found that our first run of stickers have faded in the sun. Consult your printer to use a printing technique which prevents sun damage to your message. Our stickers serve several purposes. The are highly visible in our town which has reverse angle parking in the main street. They continue to reinforce the message to the vehicle owner as they see the sticker whenever they use their car. 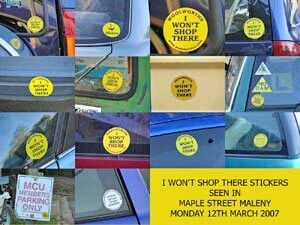 Seeing many other cars in town with stickers prominent once again reinforces that those who have the stickers on their cars are part of a large number of local people who will not forget the issues of our campaign. It is important that stickers are not placed onto public property or onto private property without the owner's permission. This does more harm than good to your cause. In our case we were up against a national grocery chain which has direct letter box advertising as part of its strategy. They no longer deliver junk mail in Maleny as we ran a highly successful campaign of returning it to Woolworths headquarters using their own freepost mail address. Over 100,000 junk mail items were returned to Woolworths over 18 months, including many from supporters in other parts of Australia! We had volunteers collect, bundle up and post back the unwanted advertising literature. Woolworths tried to stop us by changing their free-post address and asking the local post office not to accept the returned mail. We simply posted it in other locations in our region. This campaign was time consuming to those involved, and they had the personal expense of envelopes, packing paper, tape and marker pens, and in some cases petrol, but we got the message home. 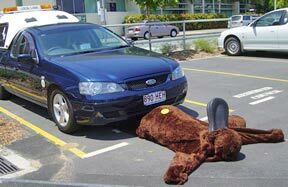 We had a wonderful platypus suit which was a favourite with the media. It was featured widely and on one occasion was 'arrested' and impounded as evidence. Injecting some humour into our campaign made it more bearable for our team, and also helped in maintaining our public profile and 'newsworthiness'. At other times we had a large 'platyometer' measuring public pledges for site purchase, a giant cheque to buy back the site, drums of 'toxic waste' to highlight pollution fears for our creek, a Wooldozer prop complete with little platypii trapped in the dozer treads, a giant tower made of construction site barrier fence sections, and a wonderful quilt made by local ladies, each panel having a theme related to our campaign. Variety, imagination, ease of identification of the imagery with the issue, practicality in getting the prop to where you want it, durability for repeated use, all need to be considered. We held regular public meetings in our local community hall. These were very well attended, not by just the campaign team supporters, but also the general public keen to find out about the issues involved. 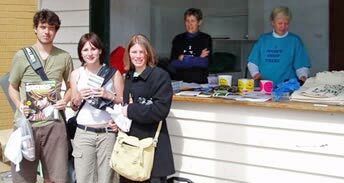 We placed news stories and articles in our local paper, and we had information booths in our main street where we handed out stickers, provided flyers, advice about up coming rallies and meetings, and generally spread the word about our concerns over the development site. This was an important part of our campaign which required considerable volunteer organisation over a sustained period of time. We had a 'Platypus Tent Embassy' at the development site for many months involving countless thousand of hours of volunteer time - not every campaign will have the opportunity or resources to do this, but in our case it was successful in delaying the development by 12 months and helping the original developer decide to sell out to another thicker-skinned outfit. We had a mini bus load of campaigners willing to travel from Maleny to Sydney for the Woolworths Ltd 2004 Annual General Meeting. This generated good publicity for us and raised the awareness of some shareholders to our issues with Woolworths. We also held protest events in central Brisbane, other Woolworths supermarket sites on the Sunshine Coast, several protests outside the Caloundra City Council headquarters and at other venues. We also protested at the offices of the developers in Brisbane. These actions involved logistical arrangements, cost people money in petrol and considerable time, but the events were all successful at maintaining the high public profile of our campaign. We were fortunate in having many skilled people on our campaign team who were able to apply their expertise. Amongst our team we had the skills to create clear, detailed and informative graphics and maps for use in public meetings, advertising, flyers and submissions to local and state government. Being able to clearly indicate in graphical form what your issue is about will be of great help when you wish to inform the public, who will in most cases have little knowledge of the issues involved. Having a good website goes without saying. This is an excellent way of disseminating graphical information. Those with a keen interest will make use of the website, however the average public will, in our experience, make little use of it, hence the importance of TV and newspaper coverage.